Caring for your brand new aquarium. We love installing new aquariums and water features for first time owners. It is always our pleasure to share the joys of having your very own water feature in your business or home space. Recently, we installed an aquarium at CDI college in Vancouver. As first time owners of a brand new aquarium, CDI college was thrilled at the way it turned out. 1. Consider the size of the tank – While it may be exciting to own your first tank, smaller is not necessarily better. Toxins build up faster in smaller tanks, and smaller tanks are actually harder to maintain than larger ones. We recommend going with a tank that is over 10 gallons. 2. Consider Weight – A tank that is over 10 gallons may weigh 200 lbs or more, so consider a proper stand rather than a desk or table. 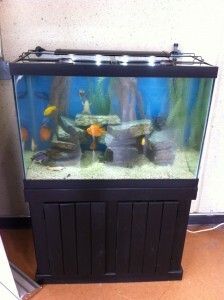 Also, tanks need to be placed outside of direct sunlight to avoid extreme temperature changes that could harm the fish. 3. Number of fish – Consider the number of fish that you wish to keep. They will consider the size of the tank that you need, and ultimately the size of the space that you will need to accomodate it. Call or email us today, and we can take care of all of the logistics for first time tank owners, and we will make sure that your aquarium is a huge success.